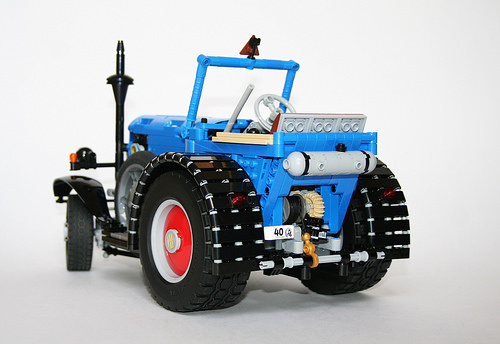 Though the original Lanz Bulldog wasn’t built for beauty, this model of the classic German tractor by Nikolaus Löwe truly shines. Combining SYSTEM and Technic parts, the model has some nice design touches; a brick-built seat, elegantly curved rear mud flaps built from Technic beams, a vertical exhaust pipe (for a hot bulb engine, perhaps? ), even running boards. The hood and sides of the engine compartment blend Technic panels and beams for a clean look. 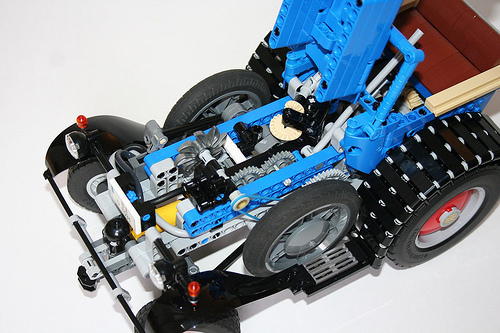 A Technic pneumatic engine powers the model, as a look under the hood reveals. Other functional parts include a flywheel on the side of the model that transfers energy to the mid-engine wheels; a winch in the back; and even wheel-operated steering. The rear of the model proudly sports a Technic 40th anniversary element for the license plate. 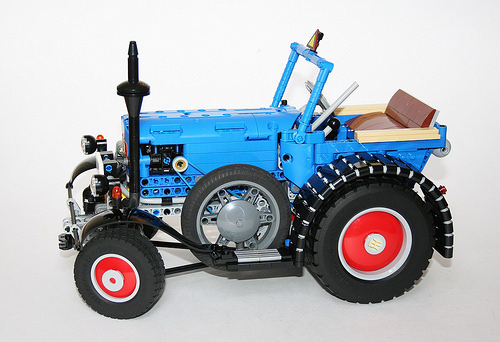 To see a similar tractor model like this in action, check out Nico71’s “Hot Bulb Pneumatic Tractor” video.